Back in 2010 we finally faced the fact that our increasingly leaky patio roof was going to rot the structure underneath, and I didn’t want to even know what 24′ long 2x12s might cost. Another summer of other projects (wrapping up the painting, I believe) caused the roof to not get done over the summer/fall, so we (read “I”) eventually broke down and agreed to hire someone to do it for us. If you look back at that project, the results were pretty nice. 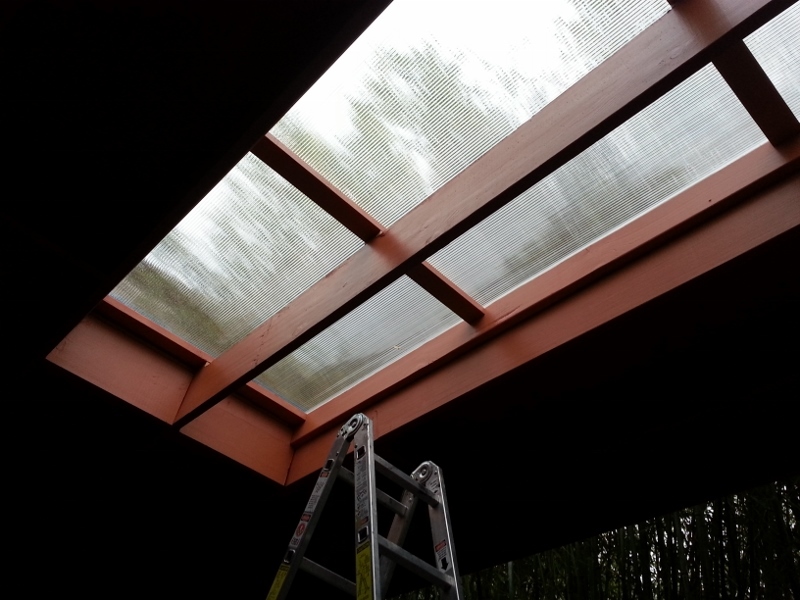 The polycarbonate panels let in a ton of light and really brightened up the back rooms in our house. However, as the title may have given away, we hired the lowest bidders, whose work quality was…well, what we deserved. They made a number of preventable errors. The first was tearing off the old metal panels and installing the plywood on the rainiest day of the year. 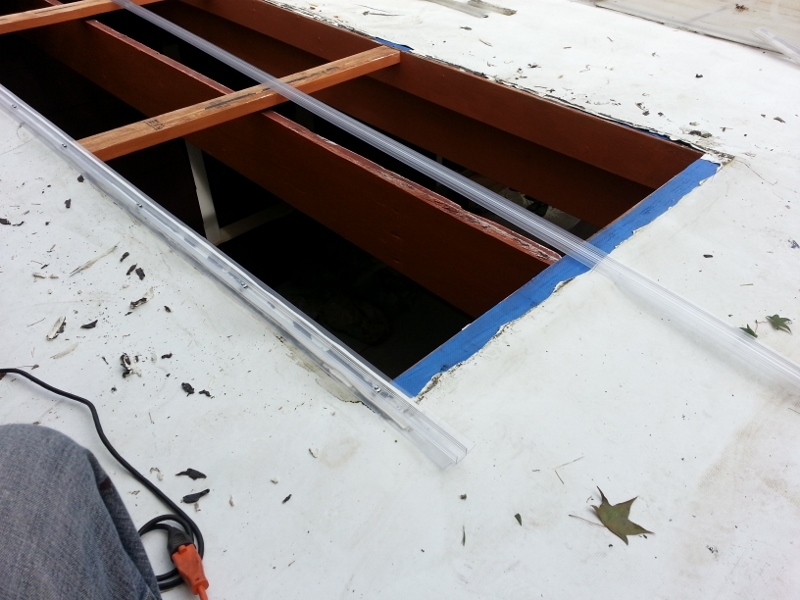 Then they covered the plywood with some tarps for a couple of days to “dry out.” Since that didn’t really happene, we ended up with all kinds of ripples in the membrane roof. That didn’t bother us too much, since we can’t see the roof and it doesn’t affect the waterproofing. Per the manufacturer, the bottom should have perforated tape to keep creepy crawlies out, and there is also supposed to be a U-channel attached to the bottom, but instead they just jammed in a bunch of silicone. And why do they end ON TOP of the raised boxes? They could have easily slid the panels down a few inches, but there was no way to do it after the fact due to the screws installed through the top. In all fairness, they didn’t look all nasty when they were installed, so after taking a look and questioning their methods, I took a deep breath and went zen. We paid contractors so that we wouldn’t have to spend any time of this, so I knew I could call them back if we had problems. I had them come back three times that winter, as new leaks developed. They’d jam in more caulk, and it’d hold for another month. Then the other leak would start. Eventually I complained enough and made them understand that they would never be able to fix this because of the way they had installed them. 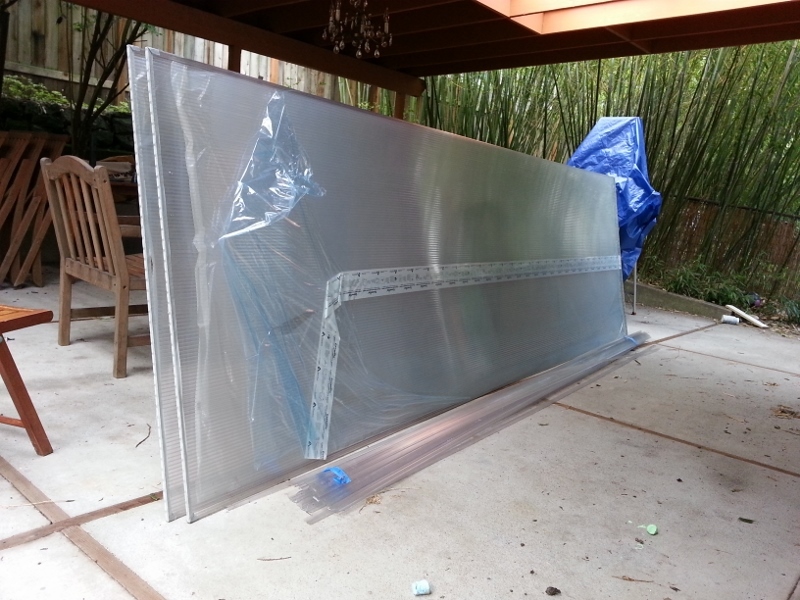 So they agreed to purchase new, custom length 13′ panels to ensure enough overhang. During conversations with the company owner, though, it became clear that they were going to install them in the same way, and I was also concerned about the screws penetrating the top. When I brought this up with Stephanie, she suggested that maybe we should just ask for the panels and let them off the hook for future repairs. That way we could make sure they were installed correctly. So, if you are following the timeline, we got the panels delivered sometime in 2011. They promptly disappeared into the garage, where they sat for a good two years. 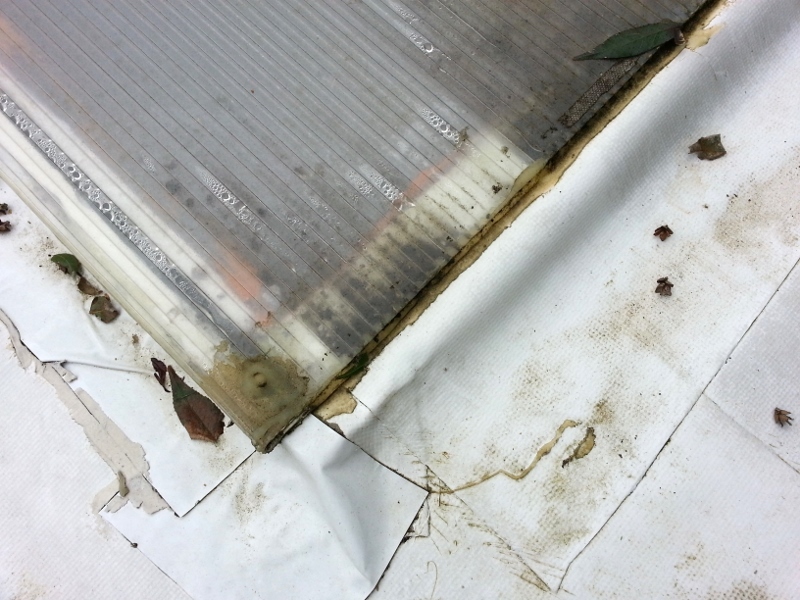 The leaks have been minor, but the new worry was that it might start leak onto the plywood, causing issues under the membrane. Also, the amount of mildew growing up the tubes was getting pretty disgusting looking from below. So, last week I pulled the panels out of the garage…. 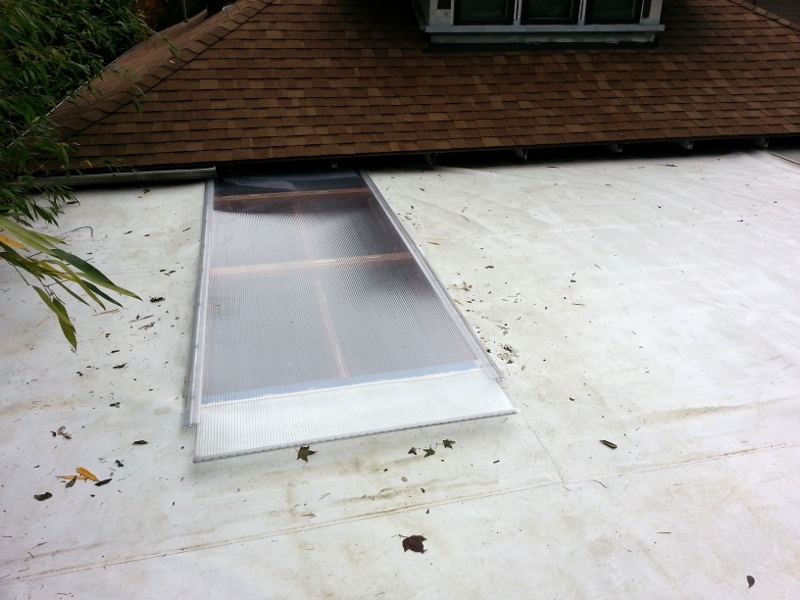 and pulled out one of the skylights. 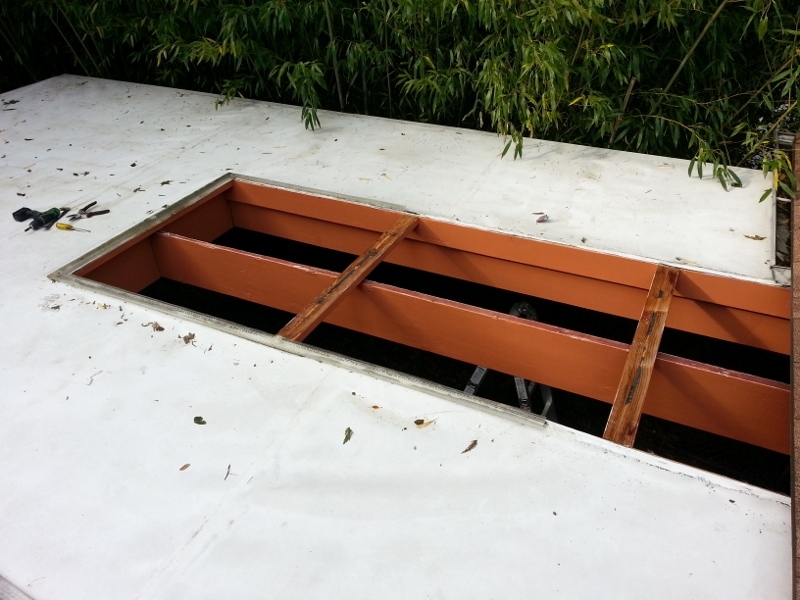 I had planned to remove them as intact as possible, thinking someone could use them for a garden shed or something, some of the silicone the roofers used was actually an adhesive, and it was nearly impossible to get off the bottom edges of the panel. It took me about 2 hours to work off the perimeter of panel that you can see in the photo. I had to pull up on it as hard as I could and nick the edge with a utility knife, inch by inch. Also, I had to be very careful not to cut into the membrane. I did slip a couple of times, but thankfully it was in areas that would be covered by the panel. Instead of screwing through the top, I used the channels that clamp the panels from each side. Using the channels means that we don’t get the same overhang that we had before, but I used some compressible foam that should hopefully prevent any water from creeping through the sides. We’ll see how it holds up during the winter. And lastly, the view from below. We haven’t posted it yet, but we painted the patio ceiling this summer. It looks so much more finished than it did with the fading stain and the unpainted plywood. Did the new panels ever leak? They certainly make the patio area pleasant!